Jonah: A VeggieTales Movie is a 2002 American computer-animated comedy adventure musical film produced by Big Idea Productions and released by Artisan Entertainment through its F.H.E. Pictures label. It is the first feature-length film in the VeggieTales series. The themes for the film are compassion and mercy, using two stories as illustrations. The first takes place in the current day and concerns a mishap with Bob the Tomato and Dad Asparagus on the way to a concert; the second, set in ancient Israel, is based directly on the biblical story of Jonah. Through both stories, compassionate and mercy play a role in giving people a second chance. The film also features the Pirates Who Don't Do Anything in both segments who were first seen in the Silly Song of the same name in Very Silly Songs!. Most of the animation was done in house by Big Idea Productions. [not verified in body] Jonah: A VeggieTales Movie premiered on August 14, 2002, at a Hollywood movie theater[which?] and came out as a regular release two months later on October 4, 2002. The film also came out on VHS and DVD on March 4, 2003, as a worldwide home video release in both full-screen and anamorphic widescreen formats with a two-disc collector's edition. A DVD reprint with the feature and bonus features was released on January 29, 2008, by Word Entertainment and on Blu Ray in 2011 by Lionsgate (Artisan's successor), another reprint was released in 2018 by Universal (Big Idea's current parent company). It received mixed to positive reviews from critics and grossed $25.6 million. Bob the Tomato and Dad Asparagus are driving Veggie children to see the popular singer "Twippo" in concert. During the drive, Laura taunts the other children because she won a backstage pass, which particularly annoys Junior. Meanwhile, Bob is frustrated with Dad for singing songs and playing his guitar instead of helping him with the map. After Laura's taunting distracts Dad and causes him to accidentally strike Bob on the head with his guitar, he unwillingly breaks off the steering wheel. This causes Bob to lose control of the van, leading Laura to lose her pass before Bob reattaches the steering wheel. Soon afterwards, a porcupine shoots out two of the van's tires with her quills in order to protect her babies, causing the van to veer off the road and careens down a hill, stopping short of a river. In a nearby seafood restaurant, Bob (with a porcupine quill attached to his behind) blames Dad Asparagus for the crash and Junior tells Laura losing her pass was her own fault. While Bob goes to call a tow truck, Junior is met by The Pirates Who Don't Do Anything, who tell Junior he was being rather tough on his friend and encourage him to show some compassion. To emphasize, they tell all the Veggies a story about a man of God named Jonah. Jonah (played by Archibald Asparagus) is a Prophet of ancient Israel who goes from town to town delivering God's messages. But when God asks him to deliver a message to Nineveh, a town notorious for its corrupt citizens, he resents Him and runs away to Tarshish with The Pirates. After leaving port, a guilt-stricken Jonah goes below deck to rest where he meets a salesman caterpillar named Khalil, who agrees to go with Jonah to sell his merchandise. After experiencing a nightmare, Jonah awakens to find the ship beset by a great storm. Captain Pa Grape concludes the storm has been sent because God is angry at someone on the ship. The group decides to play Go Fish to divine who is at fault. Jonah loses the game and is forced to walk the plank. As soon as Jonah is off the ship, the skies clear. The Pirates attempt to reel Jonah back in, but before they can do so, Jonah is swallowed by a giant whale. The pirates attempt to attack the whale using a cannon with cannonballs and a bowling ball as ammo, but the whale merely swallows the ball (which Khalil is hiding in), disgorges Jonah's lifebelt, and swims away. Inside the whale's stomach, Khalil finds a grieving Jonah and the pair are soon visited by a host of God's angels, who explain that if Jonah repents, God will grant him a second chance. Upon repenting, Jonah and Khalil are spit up onto the shore, where they ride Jonah's camel Reginald to Nineveh. As Jonah reaches the entrance, The Pirates appear and help sneak him into the city under the guise of having won the Mr. Twisty's Twisted Cheese Curls sweepstakes. The group is soon arrested after Larry tries to steal the King's Cheese Curls and are sentenced to death. As a last request, they are granted an audience with King Twistomer. Jonah then delivers the message given to him by God that the Ninevites should immediately repent of their ways forever or Nineveh will be destroyed; King Twistomer and the Ninevites quickly agree. Still expecting God to destroy Nineveh for their past sins, Jonah watches and waits from a distance in the hot sun. God provides a plant to shade Jonah, only for Khalil to eat a single leaf off the plant, which kills it. Jonah laments the dead plant, and Khalil is disappointed Jonah shows compassion for a plant, but not the Ninevites. Khalil then tries to explain God is compassionate and merciful and that he wants to give everyone, both Israelites and non-Israelites, a second chance. Jonah refuses to accept this and states it would be better if he was dead. The story ends with Khalil and Reginald leaving Jonah to his sulking. Back in the present day, the Veggies are disappointed in the anti-climactic ending, but come to understand the point of the story: God wants everybody to show compassion and mercy, even to those that do not seem to deserve it. Twippo then appears in the restaurant unexpectedly and offers to give everybody a lift to the concert, while Bob forgives Dad Asparagus and Junior gives his Twippo ticket to Laura. The film ends with a song and the surprise arrival of the tow truck driver, who is none other than Khalil. In 1999, Phil Vischer proposed a film adaptation of VeggieTales based off the story of Jonah. The film's script and songs were completed soon afterwards. In 2000, Big Idea announced that the film will be released sometime in 2002. A teaser trailer for the film was released with the VeggieTales episode, "Lyle, the Kindly Viking". The film was the first to be animated entirely in Autodesk Maya. Before the film's release, Vischer predicted that the film would break even if it grossed $25 million, and it ended up grossing just barely over that much, at $25.6 million. Based on 55 reviews collected by critical response aggregation website Rotten Tomatoes, Jonah: A VeggieTales Movie has a 65% approval rating from critics, with an average score of 5.8 out of 10. The site's consensus reads, "Jonah teaches wholesome messages to children in a funny, bouncy package." On Metacritic, which assigns a normalized rating out of 100 to reviews from mainstream critics, the film has an average score of 58, based on 20 reviews. 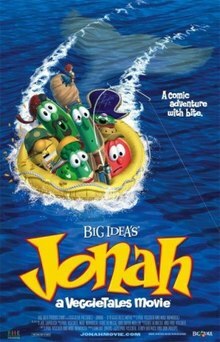 In 2008, Universal Pictures and Big Idea, Inc. released a quasi-sequel to Jonah: A VeggieTales Movie called The Pirates Who Don't Do Anything: A VeggieTales Movie. It was the first movie from Big Idea that wasn't animated by Big Idea; most of the animation was produced at Starz Animation. Larry, Pa Grape, and Mr. Lunt as The Pirates Who Don't Do Anything were the only returning characters from Jonah: A VeggieTales Movie, and the movie made no reference to the previous film. ^ In 2018, the film's distribution rights were purchased by Universal Pictures (current parent company of Big Idea via DreamWorks Animation's DreamWorks Classics) from Lionsgate (owners of the Artisan Entertainment catalog). ^ a b "Jonah - A VeggieTales Movie". rottentomatoes.com. October 4, 2002. Retrieved October 1, 2015. ^ a b c DeMott, Rick (October 4, 2002). "Big Idea Productions: A Success Story Anyone Can Believe In". Animation World Network. Retrieved January 7, 2018. ^ Feiwell, Jill (March 13, 2001). "Big idea to bow veggie 'Jonah'". Variety. Retrieved October 16, 2017. ^ "VeggieTales Going Hollywood, 'Inventors' Bow on DVD". Billboard. 113 (13). March 31, 2001. p. 74. Retrieved October 16, 2017. ^ Billy Joe McGuffrey (From "Jonah: A VeggieTales Movie" Soundtrack) (YouTube). VeggieTales - Topic. February 20, 2017. Retrieved May 8, 2018. ^ Bald Bunny (From "Jonah: A VeggieTales Movie" Soundtrack) (YouTube). VeggieTales - Topic. January 25, 2017. Retrieved May 8, 2018. ^ Steak and Shrimp (From "Jonah: A VeggieTales Movie" Soundtrack) (YouTube). VeggieTales - Topic. January 25, 2017. Retrieved May 8, 2018. ^ Jonah Was A Prophet (From "Jonah: A VeggieTales Movie" Soundtrack) (YouTube). VeggieTales - Topic. February 19, 2017. Retrieved May 8, 2018. ^ Newsboys - In The Belly of a Whale (YouTube). Darwin Bonilla. August 23, 2006. Retrieved May 8, 2018. ^ Credits Song (From "Jonah: A VeggieTales Movie" Soundtrack). VeggieTales - Topic. January 25, 2017. Retrieved May 8, 2018. ^ "Jonah: A VeggieTales Movie". Metacritic. Retrieved October 1, 2015. This page was last edited on 18 April 2019, at 23:54 (UTC).